Rumsfeld passes along Michael Hayden’s interview on 60 Minutes in which Hayden discusses the danger of Osama bin Laden. Rumsfeld directs his staff to take a look at whether it really takes 40 hours of maintenance to keep an F-16 in flight. Rumsfeld declares, “We certainly are going to want to reduce the size of OSD.” He solicits suggestions from various area and services. Rumsfeld is having a difficult time finding the Policy Planning Staff within the Department of Defense. Rumsfeld prepares for his meeting with Russian Minister of Defense Sergey Ivanov. Rumsfeld instructs that SecDef staff be reduced from 56 personnel to 40-45 or fewer. Rumsfeld instructs his staff to give a “specific list” of things at DOD that have been “stopped or cut out” to save money. Rumsfeld confirms, “The United States does not today have the ability to defend against ballistic missiles.” It still does not. 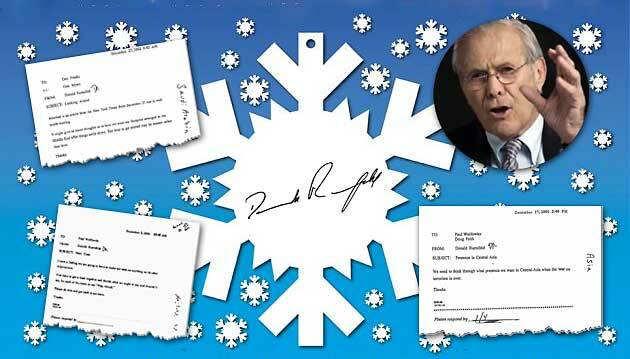 At 10:15 AM on September 10, Rumsfeld authored a snowflake – the term used to describe his usually one-page, often one-sentence, memos that he sent to his underlings to ask a question or issue an instruction – bemoaning the quantity of DOD agencies, surgeons general, inspectors general, judge advocates general, Congressional Relations functions, and Public Affairs functions. He concluded the memo by asking, “Is this all really necessary?” In a separate September 10 item, he pondered abolishing the Armed Forces Staff College. The September 10 memo is one page out of an estimated 59,000 pages the Pentagon has begun to provide in segments to the Archive in response to its FOIA suit. The next snowflake in the corpus is dated September 12, 2001. In it, Rumsfeld instructs, “Someone ought to be thinking through what kind of an event we are going to have for the people who died here.” In the aftermath of the September 11, 2001 attacks, the Pentagon budget expanded from 325 billion in FY 2001 to 447 billion in FY 2006 and military personnel estimates rose from 76,888 to 111,286 during the same period, ending Rumsfeld’s war on bureaucracy. 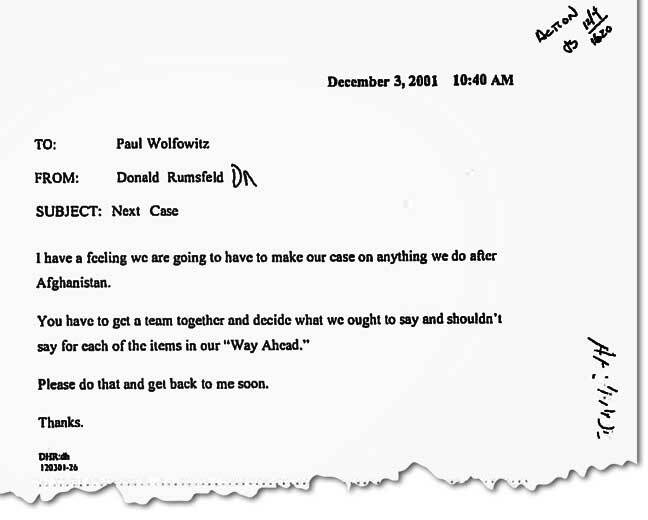 Rumsfeld eschewed modern email communication and used paper and ink instead, because he believed it was much easier to keep paper on file and track the progress of his dictums and queries. 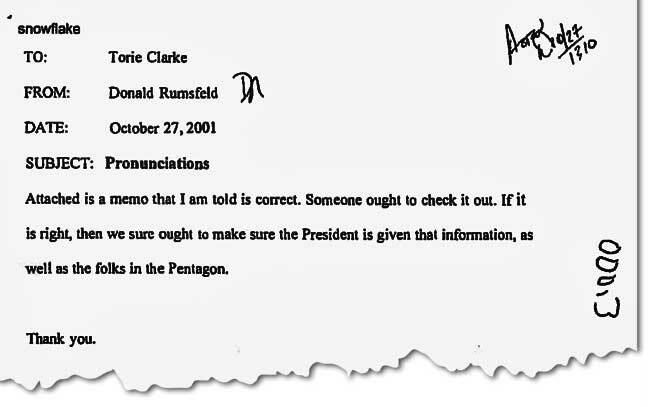 Though quick for Rumsfeld to dictate or type, these memos requesting actions, position papers, or research were a significant burden on Pentagon employees, growing, in Rumsfeld’s own words, “from mere flurries to a veritable blizzard.” According to Washington Post reporter Robin Wright, one of the first to disclose Rumsfeld’s use of snowflakes, it was not uncommon for him to send up to 60 snowflakes on a given day. Rumsfeld began publishing a relatively small subset of these snowflakes to publicize his 2011 memoir Known and Unknown. 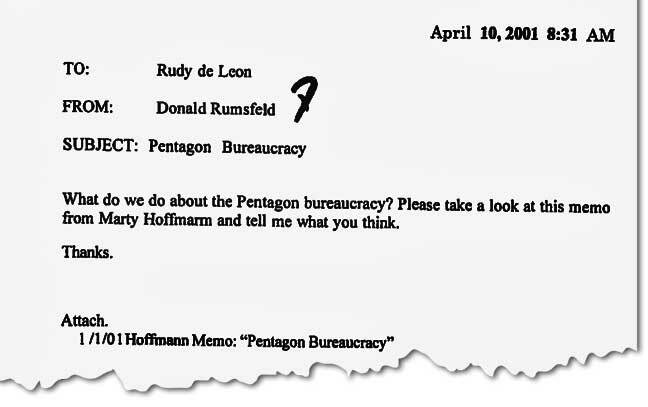 The DOD release of these documents to Rumsfeld caused a stir among researchers and historians whose FOIA requests for the same material, made years earlier, continued to languish in the DOD queue. In June of 2011, the Archive filed a FOIA request for the entire body of snowflakes. Six years later, not having received a single snowflake from that request, the Archive filed a Freedom of Information Act lawsuit against the Department of Defense. Represented pro bono by the firm Skadden, Arps, Slate, Meagher & Flom, the Archive filed its complaint on March 17, 2017. Skadden attorneys Melissa Smith, Cliff Sloan, and Gregory Craig of Skadden Arps, had the pleasure of hearing the Department of Defense attorney Mark Harrington confess at an August 7, 2017, hearing, "As far as the delay in the initial response to the request, all I can do is fall on our sword; that was too long." Judge Tanya S. Chutkan agreed, calling the DOD six-year delay "unconscionably long." The Department of Defense is now releasing the snowflakes on a rolling monthly basis. In addition to highlighting particular items, the Archive is posting them in their entirety online as they become available to us on a special section of our website named "Rumsfeld’s Snowflakes." The full corpus of snowflakes is a critical historical resource. The snowflakes serve as a sort of ultimate Pentagon chronology, touching on such diverse DOD issues as staffing, Rumsfeld’s personal requests, advice from such notables as Frank Gaffney and Newt Gingrich, communications from Rumsfeld to President George W. Bush, relations with Russia, China, and other nations, and the DOD’s strategy and conduct in the wars in Afghanistan and Iraq. On this page, peruse a selection of snowflakes the Archive found notable, then explore the first full release, with more to come! Finally, tweet other notable releases using the hashtag #rummysnowflakes. Rumsfeld recommends the abolishment of the Armed Forces Staff College, stating that its 16 week program “is worth about 4 weeks” and that it covers the same subjects as the Army, Navy, and Air Force Staff Colleges. The first known snowflake after the September 11, 2001 terrorist attacks. Rumsfeld complains that the NSC is tactically, not strategically oriented. Rumsfeld pushes for the military to adopt drones. Rumsfeld requests a copy of a Washington Times cartoon depicting himself, President Bush, Vice-president Cheney, and National Security Advisor Condoleezza Rice as cowboys searching for Osama bin Laden. Rumsfeld suggests that the correct pronunciations of “Islam” and “Muslim” be sent to President Bush. Rumsfeld is less than thrilled to receive Newt Gingrich’s advice on Afghanistan. Rumsfeld envisions a time when the war on terrorism is over.